LG revealed a new Windows 7-powered tablet this morning at Computex. 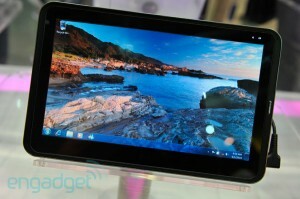 According to Engadget who managed to get their hands on the device for a bit, the tablet being shown off on the show floor was sporting a 10.1-inch screen, Intel Atom Z530 processor, 1GB of DDR2 RAM, Windows 7 Home Premium, a 1.3 megapixel front-facing webcam, an SD card slot, 802.11b/g/n WiFi, a 7200mAh battery and a micro-HDMI output. With all that the UX10 is certainly a worthy competitor against the iPad, which has currently sold more than two million units in just two months. What features would you like to see in an iPad competitor?